The Madison Gel Memory Foam Pillow Top Mattress is the industry's lowest-priced model, when compared to those with the same (or a very similar) makeup. 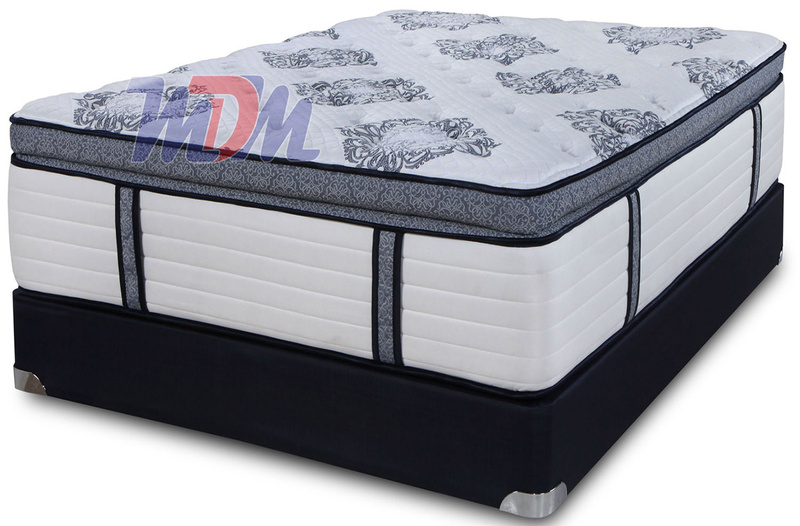 Two layers of individual coils (well over 2000 coils in total), gel memory foam, a luxurious pillow top, foam encasement and several other comfort and support layers make up what will surely become one of the best sellers of 2014-2015! This "Signature Series" mattress offers nearly every modern feature imaginable - for a very affordable price. There are no short-cuts in any aspect of this mattress's construction or design. Perfectly crafted to meet the needs of couples who - between the two people - may have a different preference in terms of feel, you simply can't lose with the Madison Pillow Top with Gel. The combination of micro coils and pocket coils give a body contouring support system; as does the layer of gel memory foam. The additional comfort layers and the elegant pillow top add to the softness that all but masks a strong, two-tier inner spring system that is comprised of over 2000 total coils. Symbol Mattress has really done something special in offering a 16" hybrid model of this level of quality for under $1000. (based on the queen price). I prefer the firmer models of mattresses but that is because my back requires a strong support system. With that being said, even I would be 100% satisfied sleeping on this bed every night. HIGHLY RECOMMENDED!